Lousy exposure, great moment. 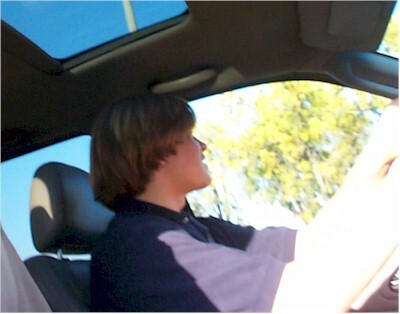 Scott passed his driving test, the last step in gaining his CA license, just before I took this photo. He was a bit nervous, but the hour-long wait seemed to calm him a bit, and helped him focus on the driving, rather than the magnitude of the moment. We're quite pleased with our little guy. To celebrate, Scott drove Matt to Roberto's for a nice dinner. Previously, he had to be accompanied by one of us parents.